Of all the artists to emerge from within Seattle’s grunge scene, Kurt Cobain was the one who most seemed to take Neil Young’s words to heart by living as if the lyrics had been written specifically for him. When he was found dead of a self-inflicted gunshot wound in April 1994, a generation was shaken to its core, even if his departure from this mortal plane wasn’t exactly a surprise. For several years, Cobain had been battling heroin addiction, and in the weeks preceding his death, he not only had overdosed on a combination of muscle relaxants and alcohol, but also his wife Courtney Love had called the police, claiming that he had locked himself in a room with a gun. There’s no doubt that Cobain was a troubled soul, and at least part of his internal conflict emanated from how he viewed his art. Even today, the debate rages over whether Nirvana simply was following its muse or whether it also was chasing its commercial aspirations. Considering that the evidence seems to fall on both sides of the equation, the truth likely is that the group was struggling to walk a line down the middle, one that would allow it simultaneously to retain its credibility and earn a living. As the front man for the group, the forces that tugged at Cobain surely were immense, and between the industry representatives and the fans, he was being pulled strongly in opposing directions. Although he accepted the burden that had been placed upon him, his inability to cope with it is what eventually took his life. Recorded in November 1993, Unplugged in New York is, perhaps, the only moment when Nirvana’s commercial and artistic inclinations were in perfect equilibrium. Without a doubt, it remains the most accessible of the ensemble’s pursuits. At the time, though, it wasn’t at all what anyone expected from the band. It bathed Nirvana’s output in a new light, yet, oddly enough, it was completely in character for the ensemble. Viewed in hindsight, it also was the calm before the storm. Anyone who followed Nirvana’s ascent firsthand will find it difficult to approach Unplugged in New York with a critical eye and a level head. Over the years, the ensemble’s 60-minute set of material has grown in stature to the point where it has assumed almost mythological proportions. For certain, it was an emotionally raw performance, and with the knowledge of the events that transpired in its wake, it has become even more unsettling to watch. Sitting on a stage that was bedecked with flickering candles, vases of lilies, swooping drapes, and a chandelier, Nirvana looked as if it was performing at a wake. As it launched into About a Girl, its initial hesitancy and its uncertainty with what it was about to do became apparent. Over the course of Unplugged in New York, as it ran through an unexpected selection of tunes, Nirvana did succeed in settling down, and with the glowing support and adoration from its audience, the band — and Cobain, in particular — regained its confidence. It’s telling, though, that two of the finest moments of the show were cover songs. Not only did the group deliver a sterling adaptation of David Bowie’s The Man Who Sold the World that was part-tribute and part-commentary upon Nirvana’s predicament, but it also unleashed a bone-chilling interpretation of Lead Belly’s Where Did You Sleep Last Night? that surely must have been a message of sorts to Love. 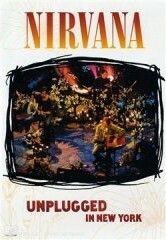 Nevertheless, Nirvana’s performance on Unplugged wasn’t perfect, not by any stretch. In fact, there were times when Nirvana momentarily wrestled with its songs and its arrangements. In place of bombast, the group showed tremendous restraint, and each mistake that it made was magnified by the subdued, laid-back atmosphere. Cobain’s voice, for example, occasionally struggled for the right nuances, and the guitarists adopted a fairly formulaic approach that lent the material a propulsion that was weary and meditative. Wisely, Nirvana obtained some assistance in coloring its material. For all intents and purposes, guitarist Pat Smear now was a member of the ensemble, and graciously, Curt and Cris Kirkwood from The Meat Puppets were invited on stage for a trio of songs. Cellist Lori Goldston, however, proved to be Nirvana’s secret weapon for the evening. Her sorrowful and sympathetic accompaniments dovetailed with Cobain’s melodies, which in turn gave tunes like Dumb, Something in the Way, and All Apologies a lovely, Beatle-esque air. In the end, all of Nirvana’s miscues were erased by the honest intimacy that was inherent in the group’s portrayal of its work. Still, the footage that aired on MTV in December 1993 only told a portion of the story. In this regard, the newly minted DVD incarnation of the band’s performance — which is presented in a striking surround sound mix — paints a much broader portrait of the engagement. While the myriad of cover tunes that Nirvana tackled hinted that the group had approached its appearance on the program from a different perspective than most, it is the re-inclusion of the casual, between-song banter — not the two songs that were excised from the broadcast (Something in the Way and Oh Me) — that completes the picture by revealing just how much fun Nirvana was having. Adding to the aura, Unplugged in New York also includes rehearsal footage as well as interviews, which were conducted for an MTV news segment that aired in 1999. The result is that the collection provides an insightful glimpse at Nirvana as it moved through a very unique time in its career. Although it was filmed while the band was riding high, the program also highlights the uncertainty of the ensemble’s search for whatever its next move would happen to be. In the wake of Cobain’s death, such questions inevitably were left unanswered, but the abundance of ideas that drifted like wraiths through Nirvana’s Unplugged set clearly demonstrated that grunge and punk were the beginning rather than the end of its journey. Unplugged in New York is available from Barnes & Noble.